AJV Alumni Jazzmin Babers was named one of ten finalists for the 2016 Senior CLASS award. Part of the winner's selection is based on votes from the public. You can support Jazzmin by voting here. You can vote once a day every day until December 5th. To be eligible for the award, a student-athlete must be classified as an NCAA Division I senior and have notable achievements in four areas of excellence: community, classroom, character and competition. An acronym for Celebrating Loyalty and Achievement for Staying in School®, the Senior CLASS Award focuses on the total student-athlete and encourages students to use their platform in athletics to make a positive impact as leaders in their communities. 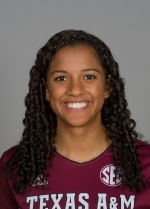 Jazzmin also set the Texas A&M record for most career block assists (458 and counting) this weekend. Read more about Jazzmin and her merits on her Senior CLASS player card.